This DK-3.0 Laser Engraver is especial designed for DIY Laser Engraving Machine with professional control software, giving you extreme portable experience. This laser engraving machine features the function of print carving & cutting. This mini laser engraving machine with higher precision and higher stability than the old version is great for DIY engraving beginner. It supports adjustable laser power, convenient and suitable for all kinds of flammable materials. Special Structural Design: New structure design of single-arm movement makes it lighter and more portable while also ensuring the stability. USB DIY laser engraving machine for laser carving and more cost-effective than normal engraving machine. Support our professional self-developed software for Win 7, XP, Win 8, Win 10 which supports a variety of image formats. 170mm x 200mm large carving space, moveable cantilever shape design, no engraving height and material size limitation. 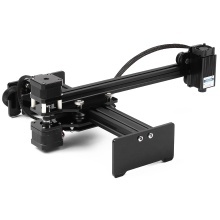 XY axis single motor and individual control, 2 stepper motor providing faster moving speed. 3 Kinds of 1600mw / 5000mw / 7000mw optional laser module with cooling fan, high laser engraving power and long working time. Can print any pictures easily and can be directly read in jpg, bmp, PXIG, GIF, ICO, png, gcode, etc. Unique frame and weak light automatic positioning makes the image positioning easier. Easy Operation: No need to learn G code, simply drag an image in to the software then you can start to engrave. Get a quick start to interests of laser engrving. Newly designed V groove aluminum track and matching roller bearing for higher accuracy and better stability. Adjustable laser power via the software according to different materials to meet most requirements of laser engraving. Come with a pair of laser protective glasses to protect your eyes from getting hurt by laser. Aluminum and acrylic body with fine workmanship show excellence in quality. Interesting to install and use, perfect gift for engraving DIY enthusiasts. 1. DIY Kit, Need To Assemble By Yourself. We have assembled the machine into 2 parts: the base and the arm, you just need to install 2 parts together and connect the cables. Then it&apos;s ready to use. 2. Please wear laser goggles during using and avoid touching the laser directly with your eyes and skin! 3. Materials can be engraved: wood, bamboo, paper, plastics, leather, acrylic, rubber, bone, horn, silicone, sponge sheet or other flammable plastic (such as phone case, mouse, pencil, name card, wallet, plastic comb). 4. Materials can’t be engraved: metals, glass, stone, ceramics, jewelry, silver, reflective material, translucent & transparent material. 5. Only the 7000mW laser engraver can especially engrave oxidized metal such as 304 and 201 matte drawing stainless steel, anodic oxidation metal and dark electroplating metal.